This 7″ was planned for the ill-fated European Racebannon tour that never happened. Nevertheless, Modus Operandi went ahead and released it, presumably as a tribute to what might have been. 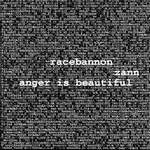 Most Americans will probably think of this as just another Racebannon record, but I actually purchased it for the German band Zann, who I was lucky enough to see in Europe this summer and who totally rocked the house. I got their excellent demo then, and this song is a nice follow up to it. Zann brings the ultra chaotic, ultra distorted assault, with production and a musical style very similar to the Honeywell LP. They share their side of the record with another German band, Anger is Beautiful, who have what is in my opinion the best song on this 7″. Super intensity, loud/soft dynamics, and some serious head nodding make Anger is Beautiful a band to be reckoned with. Meanwhile, on the other side of the record, Indiana’s Racebannon returns with their trademark fun house vocals and borderline nonsensical lyrics to let Europe know what they’re all about. The song is one long smoldering build that gains power as it goes, growing and growing until it falls apart at the end into a mass of noise and paranoid shrieking. The song is not so much heard as experienced, and it’s quite a ride. Pick one up before they’re gone – I don’t think that there are too many out there.